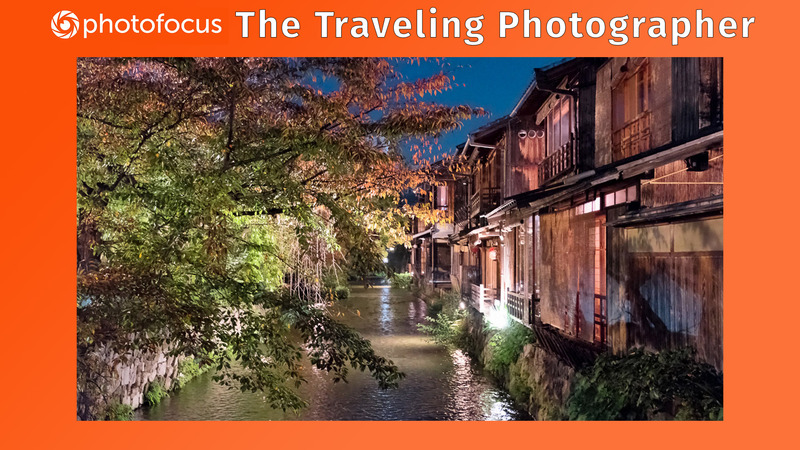 The eastern margin of Kyoto is a treasure trove as well, with much to reward the traveling photographer. As always when traveling, flexibility and portability are keys to maximizing your photographic opportunities. It is a balancing act, trying to anticipate useful focal lengths, while not being overly burdened and bogged down with a heavy bag. In many instances, less is more. It can be a good photographic exercise to intentionally pare down to one or two lenses, thus being forced to seek out scenes suitable to your available focal lengths. Depending on the season, famous temples and beauty sites in Japan can be crowded. Tripods are often forbidden, so one needs to be prepared to compensate when handholding. Cherry blossom season in Kyoto is spectacular, but be prepared to share it with crowds. Over a series of visits to Kyoto, I have adopted different strategies when heading out for the day. I almost never carry a true photo backpack when out for the day, although I do travel to and from my destination with a well-traveled and padded Gura Gear bag (which sadly is no longer made). Most often, my primary rig is suspended from my body by a sturdy cross-body strap, like the Black Rapid. If I carry a second lens, it is wrapped up in a Domke lens wrap, and tucked at the ready inside a large zip-top tote bag, in which is at least a second, charged battery and lens cleaning cloth. I’ve been pleased with my results with different setups, which each have advantages and disadvantages. From lightest and least-encumbering setups to slightly more encumbering, I’ve used the predecessor of the Fujifilm X100-F (the wide-angle conversion lens would be a good addition), the Fujifilm X-T1 and more recently the Fujifilm X-T2, alternating between the 18mm f/2.0 XF R lens and the XF 35mm f/2 R WR weather resistant lens, OR a wide angle zoom — either the XF 10-24mm f/4 R OIS or the XF 16-55mm f/2.8 R LM WR. Tripods are generally not allowed in temples, but I’ve occasionally gotten away with using them at night, sometimes employed as a monopod. I’m more likely to tote a tripod at night than during the day. If you are visiting in spring or fall, check this useful website Inside Kyoto to see which temples are open at night. A bamboo forest illuminated at night is an awesome sight! The impressive Karamon entrance gate at Nijo-jo, a shogunate castle in central Kyoto is perhaps even more spectacular lit up at night (below). The richly decorated ornament adorning the Karamon gate of Nijo-jo, the shogunate castle in central Kyoto, is on spectacular display during seasonal night-time illumination during spring and fall, coinciding with hanami (flower-viewing) and autumn foliage periods. Sometimes “night time illumination” even takes the form of light shows projected onto temple structures, as when I visited the Kodai-ji Temple in November 2016. “Night-time illumination” during spring cherry blossom season or fall foliage periods may hold surprises, such as this light show at Kodai-ji Temple in Kyoto. Fushimi Inari is a distinctive sight — a series of stepped, tapering in size, brilliant orange, Shinto shrine torii gates forming a gorgeous procession up into a verdant green forest. A visit other than at first light or in the evening will be accompanied by an endless procession of visitors. This will impact the ability to use a tripod more than the enjoyment of the site. Fushimi Inari Taisha is one of the few temple complexes which is open 24 hours a day, so an evening visit with a tripod is an option I look forward to trying on a future visit. To shoot with a tripod and have fewer crowds to evade, an early (as here) or late arrival will be necessary at Kyoto’s Fushimi Inari Taisha. Kiyamizu-dera is a huge wooden Buddhist temple and UNESCO World Heritage Site, on an elevated and wooded site overlooking Kyoto. The name means clear or pure water (“mizu” means water), which refers to a waterfall on the site. Kiyomizu-dera is an impressive temple at anytime, due to its size, historical significance and setting, but it is pure magic lit up at night during cherry blossom season. The elevated siting of Kiyomizu-dera features lovely sunset views of Kyoto basin. The natural downhill egress from Kiyomizu-dera will lead to the north to a warren of charmingly restored stone streets, lined with traditional wooden houses converted to shops and restaurants. The major streets are Ninen-zaka (literally 2 year hill) and Sannen-zaka (3 year hill), named for the years of the early Imperial era in which they were laid out. This is a nice area to sample and buy teas, snacks, have a meal or source gifts or souvenirs. The restored stone streets Ninen-zaka and Sannen-zaka downhill from Kiyomizu-dera are fun to explore; I used a tripod and a long exposure (1/2 second) to capture some of the busy throngs of people traipsing up and down the stepped street. Ginkaku-ji, the so-called Silver Pavilion, is in the northeast corner of Kyoto. Unlike its Golden Pavilion counterpart, it is not clad in a precious metal. It is a lovely Zen temple complex, with stunning paths through a variety of gardens with luxuriant foliage, including a moss garden and a dry sand garden. It is easily combined with a stroll south down pleasant Philosopher’s Path. Philosopher’s path is a canal lined with cherry trees, so is especially resplendent in spring. Philosopher’s Path is always a pleasant walk along a canal, but at night in cherry blossom season, it can be a riot of color. There are multiple temples to consider checking out along the path, which ends near Nanzen-ji Temple. To see a smattering of traditional types of performances, including dance and bunraku puppetry, consider taking in a performance at Gion Corner. Unlike the annual geisha performances like Miyako Odori in spring and Gion Odori in early November (which are spectacular and highly recommended as cultural experiences), photography is allowed (no flash or tripods, so be prepared to open your aperture and bump your ISO as necessary to keep a reasonable shutter speed you can handhold (1/125 second or faster). Arrive early to claim an unobstructed view in a front row or aisle seat. If you enjoy artist’s studios, traditional architecture, crafts and furniture, a personal favorite is the Kawai Kanjiro house museum. He was a potter and wood sculptor, a contemporary of Soetsu Yanagi who was very involved with the mingei movement from the beginning. He built his home, a beautiful example of traditional Japanese residential architecture, and it is filled with objects d’art, including unique furniture of his own creation. As must be evident from these two suggested itineraries featuring highlights on the western side of Kyoto (Arashiyama) and the eastern (Higashiyama), two days is the absolute bare minimum to consider for an introduction to Kyoto. A whole week or more would not be overkill — our enjoyment of Kyoto has only deepened with repeated visits.